After approximately 2 weeks spent in isolation at her parent’s home, “Jane” returned to her own home. We were invited back to her parent’s home to test for any contamination that might be remaining after the isolation period. In addition to using Bind-It Hand Soap during her isolation, she also used the Spray and Concentrate to decontaminate the areas which we found contaminated in our previous visit. This included the shower, sink, bathroom floor, walls and toilet. – No contamination was detected on the floor, shower or walls. – We found a slight amount of activity on the light switch (we attribute this to the fact thata light switch is very difficult to clean. 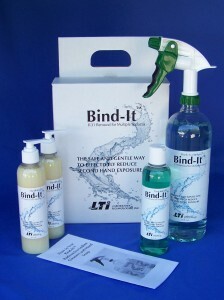 We recommend spraying a paper towel with Bind-It, then wiping the switch carefully. This is tricky at best, because it may take several applications to remove contamination, but at the same time you cannot spray directly onto a live switch. – We found a slight amount of activity in the overflow opening of the sink and on the edge of the sink drain (we attribute this to the rough surface of the sink overflow opening, as well as the seam where the sink basin meets the drain collar). Porcelain sinks are highly polished and are therefore resistant to staining. Unpolished porcelain is kind of like a sidewalk – very rough, with a lot of crevices that are difficult to clean. worked it’s way under the drain collar. Since it was only a slight amount of activity, we did not dis-assemble the drain. – In the toilet bowl, we determined that the remaining activity was bound to hard water deposits within the toilet bowl. We found that by spraying with Bind-It and scrubbing with a plastic scouring pad approximately 50% of the activity was removed in the first attempt. Jane’s parents said they would continue scrubbing the toilet bowl after we left. This left us with the thought that since hard water is such a common thing across the U.S., it would be a good idea for patients to scrub their toilets with a cleanser or a lime remover prior to their treatment. The parents asked that we check a bag of trash from Jane that they were keeping in the garage. This is the same bag which we surveyed in the first visit. The bag of trash was still so “hot” that it effectively pinned the meter. We advised that they continue to store it for several months before disposal in the garbage. Had they disposed of it at that time with the normal trash, it would undoubtedly set off alarms at the garbage dump, and may have prompted a visit from authorities. The inflatable mattress and bedsheets which Jane had used during her isolation were stored in the crawlspace to allow for decay before disposal. They were located in the far corner of the crawlspace (under the foyer, since people rarely linger in that area). We did a survey of the foyer, and discovered that we saw a substantial amount of activity coming through the floor directly over where the mattress and sheets were stored. This underscored the importance of allowing the bedsheets to decay before disposal. Based upon the very high levels of contamination which we had seen during our previous visit, we were very happy to see how effectively Bind-It worked at removing the contamination. It demonstrated to us that the cleaning instructions which we include with each Patient Care Pack were effective in conveying what surfaces to decontaminate, and how to do it. Out of an overabundance of caution, Jane also asked us to come to her own home to check for contamination she may have caused after leaving her parent’s home and her isolation. We will detail our findings in the next post.